Impact force identification from structural dynamic responses at certain points on a mechanical structure subjected to impact is a classical inverse problem in dynamics. There has been a growing demand for an efficient inverse algorithm and/or sensors that can overcome the ill-conditioning problem often encountered in an inverse analysis. This study investigates the capabilities of a polyvinylidene fluoride (PVDF) sensor to identify impact force. 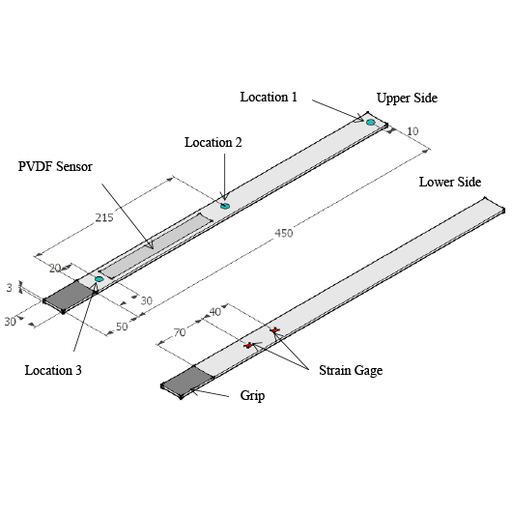 Impact force was identified from the response of a PVDF sensor attached to a steel cantilever beam. A simple method involving neither the analytical nor the experimental Green's function was used to create the objective function that was minimized during the optimization process. Results of parametric studies on the effect of PVDF output length included in the process of optimizing the objective function suggest that identification accuracy appears to be more vulnerable to peak differences than to area differences. Output lengths of 50 and 100 ms appear to yield good identification accuracy for both peak- and area-based evaluations. Furthermore, accuracy of identification seems to be susceptible to variations in the starting time of impact history. However, such susceptibility was overcome by the PVDF sensor's excellent signal-to-noise ratio, thanks to which the starting point of an impact's history can be accurately identified. Cao Vu Dung and Eiichi Sasaki, Experimental Study on Impact Force Identification Using Output Response of Polyvinylidene Fluoride Sensor, Sens. Mater., Vol. 30, No. 1, 2018, p. 7-21.